So I know the GTKAU posts are usually one-sided and, unless they’re just huge fútbol fans in general, most of my American friends and readers don’t care about the people I’m talking about. Well, for you guys, it’s time to meet a Uruguayan who is also one of the best players in USMNT history. See what I did there? Now you have no choice but to love it. Let’s get to know Tabaré “Tab” Ramos. Like Jobu, Ramos was born in Montevideo, Uruguay and emigrated to the United States at a young age. Ramos was eleven when his family came over and they eventually settled in New Jersey, where Tab began playing for local youth teams and, eventually, for Saint Benedict’s Preparatory School. St. Benedict’s was where Ramos made a name for himself. He starred there, was named a High School All-American twice and helped the Gray Bees win the state championship in 1983—the same year he won the Parade Magazine National High School Player of the Year. 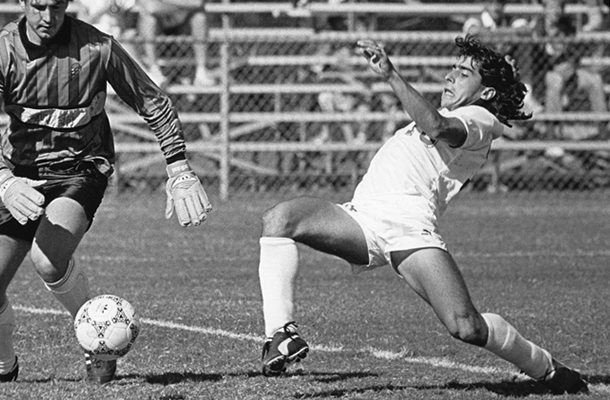 After his impressive high school career, Ramos was drafted by the New York Cosmos with the 10th overall pick of the 1984 NASL draft, but chose to attend N.C. State instead. It turned out to be a great choice, as the entire league folded just six months later. At N.C. State, Ramos continued his success, earning three All-America honors and four All-ACC honors. Although Ramos had played for the USMNT U-20 squad when he was 15, and had been a last minute cut from the 1984 Olympic squad as a 17-year old (shortly before the tournament, the IOC decided to allow professional players and all but one amateur was cut from team USA), he didn’t make the senior squad until January 1988. That would be the start of a journey that would see Ramos become one of the most revered players in USMNT history. In all, Ramos earned 81 caps for the United States (it would have been more, but injuries took away a great deal of time from his career on the pitch). 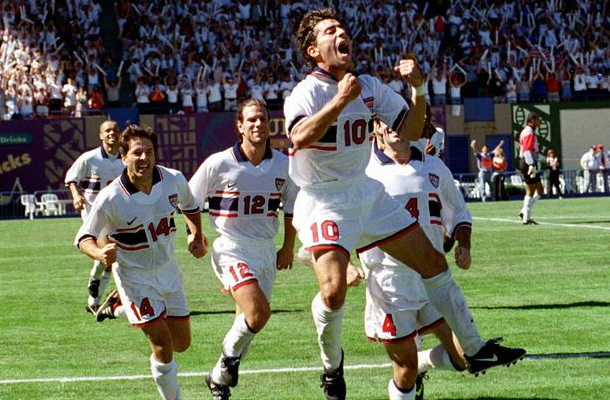 He played in three World Cups (1990, 1994 and 1998), becoming the first player (along with Marcelo Balboa and Eric Wynalda) to do so for the United States. He is also the only American to score goals in World Cup qualifying games across three different decades. Hell, he was even in a snickers commercial! If you ask most USMNT fans to pinpoint a couple of moments of Ramos’ career, they’ll probably give you two. The first, is the dramatic goal he scored against Costa Rica in 1997 during the qualifying period for the 1998 World Cup. It was his first game back from a torn ACL, and the 1-0 win basically clinched a World Cup finals berth for the U.S. The other famous moment is not as fun. Ramos started all four games for the U.S. during the 1994 World Cup, helping the U.S. reach the round of 16 by upsetting tying Switzerland and memorably upsetting Colombia. Brazilian defender Leonardo tangled with Ramos near the top of the pitch and hit him with an elbow so vicious that the Ramos suffered a fractured skull. Leonardo was red carded, but the U.S. struggled to score without Ramos, and eventually lost 1-0 on a goal by Bebeto. Ramos is also one of the most well-known figures in American domestic fútbol. He got his start on the New Jersey Eagles of the short-lived American Soccer League, scoring 2 goals in 8 games before signing on exclusively with the USSF (United States Soccer Federation to focus on qualifying for the upcoming World Cup. Eventually, he was loaned out to UE Figueres of the Spanish second division. He played there for two years before moving over to Real Betis, also of the second division. Unfortunately, Ramos missed his chance at playing in La Liga because of the injury at the 1994 World Cup (Real Betis moved up to the first division while Ramos was recovering, and he never played for them). No bother, though, as Ramos soon became the first player to ever sign with Major League Soccer (MLS), when he did so in 1995. When the league was delayed a year, Ramos was loaned out to Tigres UA Nuevo León of the Mexican league before finally being assigned to the New York/New Jersey Metrostars (now known as the New York Red Bulls) for the 1996. Although injuries kept him from reaching his true potential in the MLS, he managed to make three All-Star teams (1996, 1998 and 1999). When he retired following the 2002 season, he was the last remaining original Metrostar. He is still first in Metrostars/Red Bulls history in assists. In 2005, he was recognized for his considerable efforts with an induction into the National Soccer Hall of Fame (only the second Uruguayan inductee after Fernando Clavijo). These days, you’ll find Ramos right next to Jurgen Klinsmann on the USMNT sidelines. Ramos was named as an assistant coach just a few months prior to the World Cup. He is also the head coach of the U-20 USMNT side, where he has been helping mold future American stars since 2011.